Which Nuts Help You Lose Weight? Hazelnuts have many benefits. They are full of vitamins, minerals and other nutrients that your body needs to maintain good health. However, although many people can safely enjoy hazelnuts, you or one of your family members might experience an allergic reaction to the nuts. Hazelnuts, also called filberts, are a dietary protein source grown mainly in Turkey's Black Sea coastal area, according to the Hazelnut Council, a partnership between the top hazelnut producers in Turkey and the United States. U.S. farmers produce hazelnut crops mainly in the Willamette Valley outside of Portland, Oregon. You can purchase hazelnuts raw, roasted or ground into a paste form called dukka from grocery stores, health food stores and online food and herbal retailers. 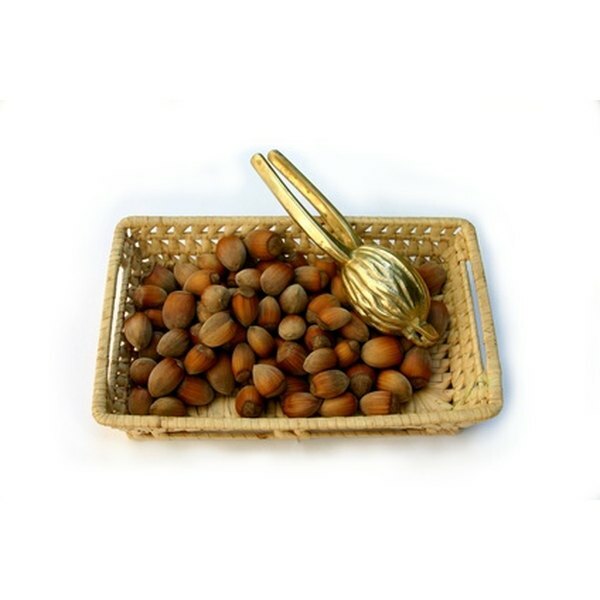 Hazelnuts contain the minerals magnesium, phosphorous, zinc, copper, iron, manganese, calcium and selenium. Hazelnuts also contain vitamin K in the form of phylloquinone, ascorbic acid, folates, thiamin, alpha-tocopherol and niacin. Furthermore, hazelnuts contain the amino and fatty acids leucine, arginine, aspartic acid, alanine and glutamic acid, according to Drugs.com. Additionally, the nuts contain potassium and vitamin E, fiber and mono-unsaturated and poly-unsaturated fats, according to the Hazelnut Council. Although you can snack on raw or roasted hazelnuts by themselves, or enjoy dukka spread over flatbreads, crackers or fruit, you can also enjoy hazelnuts in many sweet and savory recipes to experience the nut's numerous nutritional benefits. For example, you can prepare hazelnut muffins, hazelnut cookies and hazelnut shortbread. You can also add hazelnuts to main dishes such as pad Thai, or cover fish such as halibut or seafood such as scallops with a hazelnut crust made by mixing the nuts with herbs, eggs, vegetable oil and seasonings, and then dipping the seafood into the mixture before baking or pan-searing to achieve a light, crunchy coating. The U.S. Food and Drug Administration suggests eating nuts as part of a heart-healthy diet regimen to help reduce your risk of acquiring heart disease. The polyunsaturated fats in hazelnuts help keep your blood vessels healthy, which can reduce your blood cholesterol and protect your heart, according to the Mayo Clinic. Even if you've eaten hazelnuts in the past, you can develop a sudden, life-threatening allergic reaction to the nuts at any time. You should be aware of the early warning signs of nut allergies such as an upset stomach, skin rash around your mouth, or anaphylaxis, a condition marked by difficulty breathing, a drop in blood pressure, and swelling of the mouth and throat, according to NutNutrition.com.